"I have been fortunate to have been able to serve the Redwood City in my practice and in the larger community since I took over this practice in 1984. I have enjoyed my career in dentistry and continue to love practicing dentistry here on the Peninsula. I still believe in our motto, 'We want to make your world a better place... with a smile.' If we can help you improve your smile, maintain the health of your smile, and keep a smile on your face while you're here, then we know you'll be happy here. I look forward to meeting you and helping you meet your goals for your smile." Dr. Glenn Lew is one of the most experienced family and cosmetic dentists on the San Francisco Peninsula. Dr. Lew is a Bay Area native and has practiced dentistry in Redwood City since 1984. He is a member of the American Dental Association, the California Dental Association, and the San Mateo County Dental Society. He is also affiliated with the American Academy of Cosmetic Dentistry, Pac-Live Dental Contilnuum, the Sacramento Implant Continuum, and DOCS Education for Conscious Sedation. He always strives to stay on top of dental technology, using his knowledge gained from his over 35 years in dentistry to give you every advantage. Dr. Lew currently lives in San Francisco with his wife and his two sons. 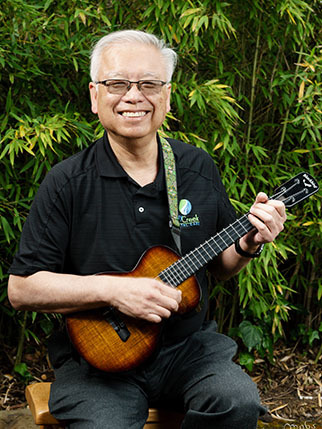 Dr. Lew's outside interests include playing guitar, bass, and ukulele; community service through his membership in the Woodside Terrace AM Kiwanis Club; and umpiring in San Francisco and Redwood City Little League. He currently teaches guitar, ukulele, and vocals at his local church.